Mustering up “rock solid technique” and “the kind of vocal velvet you don’t often hear in contemporary music” (Boston Phoenix), soprano Jennifer Ashe has been praised for performances that are “pure bravura…riveting the audience with a radiant and opulent voice” (The Boston Globe). A strong advocate of new works, she has sung with Boston Musica Viva, Sound Icon, Fromm Festival, Boston Microtonal Society, Harvard Group for New Music, New Music Brandeis, New Gallery Concert Series, Guerilla Opera, Ludovico Ensemble, and and the Callithumpian Consort. 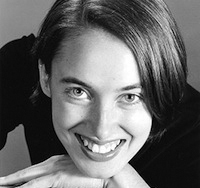 She also sings with Handel and Haydn Society, Boston Baroque, and Blue Heron. Ashe holds a DMA and an MM in voice and vocal pedagogy from the New England Conservatory and a BM in voice and music education from the Hartt School of Music. Formerly on the faculties of the College of the Holy Cross and Eastern Connecticut State University, she teaches for Music Together Arlington and the Dana Hall School of Music in Wellesley and is the Handel and Haydn teaching artist at the John F. Kennedy School in Jamaica Plain, teaching K-3 general music.